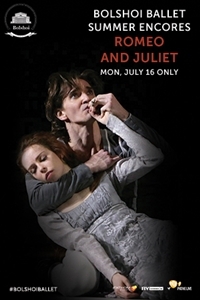 Fathom Events, BY Experience and Pathé Live present a special encore showing of the Bolshoi Ballet's Romeo and Juliet, direct from Moscow, to select cinemas nationwide on Monday, July 16 only, as part of a series - Bolshoi Ballet Summer Encores. Alexei Ratmansky, former artistic director of the Bolshoi Ballet, stages the company's premiere of his production with dramatic urgency and a fresh re-telling of Shakespeare's beloved classic. His brilliant and detailed adaptation set to Prokofiev's romantic and cinematic score reignites the story of literature's most celebrated star-crossed lovers like no other classical ballet choreographer today.